A house without furniture is just a structure. A house with ordinary furniture is simply a house. A house with leather furniture is truly a home. There’s no substitute for the beautiful, luxurious look and feel of leather upholstery. It transforms ordinary furniture into comfortable, distinctive, and unique showpieces which define your home. When you choose leather, you’re choosing the very best for your home and for your family. Here’s a closer look at the A-B-C’s of genuine leather furniture, so that you will know exactly what you’re looking at – and looking for – when purchasing pieces upholstered in beautiful leather. Many mass-produced, man-made fabrics give furniture a “perfect” appearance. Each piece is just like the next. It could be anyone’s furniture – and that’s exactly what it looks like: furniture that you’d see in any room, in any house. Leather, however, isn’t a synthetic material created in a factory to look perfect. It’s real, and lovingly crafted to showcase the hide’s distinctive look and highlight its natural, authentic marks. No leather piece looks like any other; surface blemishes and imperfections give upholstery its own rich story and make the furniture uniquely yours. That’s the true, special nature of leather. Each hide is the byproduct of a living, breathing animal, so it has a one-of-a-kind internal cell structure. When the hide is dyed, the color of the dye is absorbed differently throughout the cells – leading to the trademark dark and light patterns seen in fine leather and making its look impossible to duplicate. 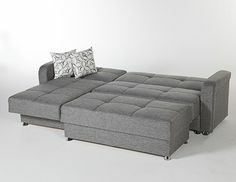 Add in the natural wrinkles, scratches, branding marks, and even bug bites (none of which have any effect on the strength or durability of the leather) which distinguish leather from any other piece in existence, and you have upholstery that isn’t “perfect.” It’s perfectly unique, and absolutely gorgeous. How Do I Know This Is Genuine Leather? There will always be unscrupulous merchants who try to pass off imitations as the real thing, whether they’re trying to sell gold-plated jewelry as solid gold or cheap knockoff purses as designer goods. On occasion, you may experience the same problem with dishonest leather merchants. There’s an extra complication when it comes to leather, though. Even if upholstery is correctly labeled and sold as “genuine” leather, that doesn’t mean that it’s high-quality. The “genuine leather” belt you buy at Target may really be leather, but all that label guarantees is that the belt is made from cowhide and not some other material. In reality, goods labeled “genuine leather” are usually on the lowest level of the quality scale and often are made from several thin layers of leftover, poor-quality leather which are glued together and then stained or painted. What you should be looking for when buying leather furniture is either corrected top grain or full grain leather, with full grain leather more expensive but vastly preferable. We’ll discuss leather grains in more detail shortly, but let’s get back to the question of what high-quality leather upholstery should look like. In a nutshell, the fine leather used to upholster furniture should exhibit the natural, subtle markings you would expect to see on a real animal hide. Perhaps the most distinctive of these signs is the mark which was branded into the side of the cow. It can be any combination of letters or numbers, images or geometric shapes; these unique branding marks (as long as they’re smooth and not ugly) can add special character to a piece of leather furniture. Surface scratches and scars are natural skin blemishes on all animals (including cows, of course) and are another indication that leather is real. Deep marks and scars are usually cut out of a hide before it is tanned, dyed and corrected (if necessary), but surface marks won’t jeopardize the integrity of the leather and add to the authentic appearance of upholstery. Similarly, it is completely natural for an animal’s skin to wrinkle or stretch over time, particularly in areas like the belly and neck. Those wrinkles, as long as they don’t detract from the overall look of the upholstery, are another distinctive feature of quality leather – as are smaller holes which look like pinpricks but are simply bite marks left by flies, ticks or other insects and predators. Again, these won’t hurt the strength of the leather but will add to its distinctive look. 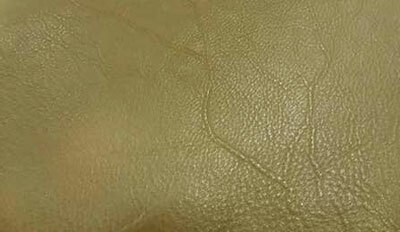 Strange lines which look like the veins of a leaf or the veins in a piece of marble, are often seen on leather pieces. These are actually the cow’s blood vessels, which become more prominent as animals grow older, and are more visible in leather taken from cows which lived in warm climates (their vessels would expand to allow heat to be released through their skin). These veins are more often seen in medium-quality leather because they’re on the bottom side of a cow’s hide, and usually don’t show in full grain leather. It is important to realize that all of the marks which have a major impact on the appearance of upholstery (like brands and stretch marks) can be, and usually are, placed on the back or sides of the furniture. That way their authenticity is evident, but they don’t draw an inordinate amount of attention away from the overall beauty of the piece. In short, the natural signs that a hide is genuine – and once belonged to a real, live cow – are crucial to the stunning, luxurious appearance of fine leather upholstery. We’ve briefly mentioned the terms full grain and top grain leather. It’s time to dive into that subject in more depth, because the look, feel and price of leather upholstery are directly related to the grain of the leather. When an animal’s hide is removed, the top portion (right below the hairline) is the most desirable because the grain in that area is tight, making the skin moisture-resistant, durable and strong. Leather made from this part of the hide, doesn’t have to be “corrected” to remove objectionable blemishes or damage, is known as full grain leather. It also looks better over time, as it develops the lovely, telltale patina of fine leather. Top grain leather which only needs slight correction and doesn’t require alteration to its existing grain pattern can approach the look and feel of full grain leather. Otherwise, uniform patterns may need to be embossed on the leather, and it may require partially clear (semi-aniline) or opaque dye treatment in order to obscure or cover undesirable markings on the hide. The more correction that has to be done on the leather, the less desirable it becomes. However, that’s largely because of aesthetics, since upholstery’s strength and durability is usually not affected by correction. Lower on the quality ladder is split grain leather, which is the underside of the hide cut off when full or top grain leather is created. It doesn’t have natural graining and needs to be corrected and dyed. You’ll often see spliced pieces of split used on the outsides or back of furniture which is otherwise upholstered with full or top grain leather. If it fits your budget, full grain leather upholstery will provide the soft feel and wonderful look you expect when you think about high-quality leather. However, partly corrected top grain leather can give you almost the same experience, at a lower cost. How Can I Find Which Leather I Have? If you’re unsure of the type of leather that you purchased by going to our interactive leather guide, it will show you the leather type based on a few, simple questions. You’ll know the quality of the leather and the cleaning method that you should use for upkeep. First and foremost, you should expect leather furniture to last for many years, as long as it’s cared for properly. 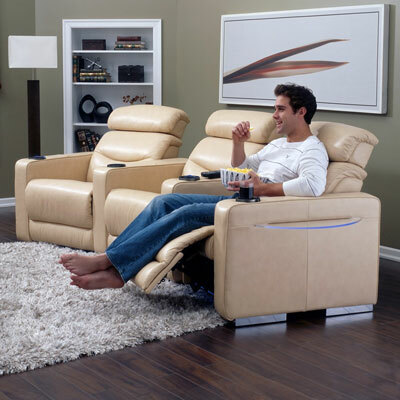 You’ll find a guide on the upkeep of leather upholstery later in this article. You should expect your high-quality leather furniture to look even more attractive as it ages, because of the patina that develops over time on natural products like leather. You should also expect your upholstery to stretch and soften with use, since animal hides aren’t overly elastic. The stretching won’t affect the durability of your furniture – it will simply make it more comfortable. Finally, you should expect that no matter what the season, your leather furniture won’t get too hot or too cool to sit in (unless you keep it in direct sunlight, and you shouldn’t). Unlike the upholstery used in most cars, the leather used on furniture is a natural product which can breathe, so it will remain nice and cool in the summer and will quickly adjust to your body temperature in winter. Aniline Dyed: Leather that is colored with soluble, transparent dyes to conceal blemishes, without the use of paint or other opaque substances which would cover the grain of the hide. Antiqued: Leather which has a darker color dye applied over a lighter colored one, for an aged appearance. Bicast Leather: A material made by covering a top grain or split leather backing with polyurethane, which is then embossed. Buffed: Top grain leather which has had blemishes or other imperfections removed from its surface by light sanding or polishing. Chromium Tanning: Using chromium salts in order to make a leather hide supple during the tanning process. Color Fastness: The measure used to determine how well leather will retain its color after being exposed to light. Correction: The process of evening the grain of top grain leather and removing unwanted blemishes through buffing and/or sanding, before the leather is embossed and dyed. Crocking: The tendency of heavily-dyed leather to allow transfer of dye colors to other fabrics or substances. Crust: A tanned, dyed, and dried leather hide which isn’t yet finished. Distressed Leather: Leather which has undergone special treatment to make it appear aged while leaving its integrity undisturbed. Drum Dying: A natural finishing process for leather, tumbling the tanned hide together with dye so that the dye can completely penetrate the leather. Embossing: Manually changing the natural grain of top grain leather through engraving, etching or stamping, to create more uniformity in the pattern. Fat Wrinkles: Distinctive creases in full grain leather caused by the wrinkling of the animal’s skin around fat deposits. Finishing: The final preparation of leather after it is tanned, including dying, embossing, glazing and/or antiquing. Full Grain Leather: The highest quality of leather, which retains its full grain because only the very top of the hide (containing the hair and follicles) is removed. Glazed Finish: A lustrous finish to leather, created by polishing the grain with a roller under heavy pressure. Gloss Finish: A shiny finish to leather usually created by applying a specially-designed substance. Grain: The unique pattern seen on the surface of a leather hide once the hair and follicles have been removed. Hand: A term used to describe the feel of leather to the hand, specifically how soft or supple it feels. Hides: Raw skins taken from cows (or other animals) for the production of leather. Leather: Tanned and finished hides. Liming: The process of removing an animal’s hair from the hide, generally by using chemicals. Matte Finish: A textured finish to leather, with a look that’s dull rather than shiny. Milling: A natural softening process for leather which can take the place of chemical treatment, with the leather tumbled in a drum. Natural Grain: Leather that fully shows its natural grain without being treated or altered. Nubuck: Pure aniline, top grain leather which feels like suede with a soft hand, thanks to a light buffing process. Patina: The beautiful, lustrous appearance which develops on high-quality leather over time. Pigmented: Leather which has been colored with opaque dyes or pigments. Pull Up: An aniline leather with wax or oil applied, so that when stretched tight it has an attractive weathered or distressed look. Pure Aniline: Leather which has been tanned and aniline dyed without any alteration of the grain and without coating to protect against cracking. Also known as naked leather. Sauvage: The use of two different dye colors on leather to contribute depth to its look by creating a two-toned appearance. Semi Aniline: Aniline dyed leather which is then coated with pigment or a clear finish, in order to ensure more even color throughout the hide. Split: The layer of leather cut from the underside of the hide, lower-quality and usually used either for the back and sides of furniture, or other leather goods like belts and wallets. Split Grain: Similar to the split; the lower layer of a hide which is not as strong as full or top grain leather and must be treated and embossed before use. Suede: Leather which comes from the split, less durable with a velvet feel. Tanning: The process of treating raw hides so they will endure when used as leather. Top Grain: The second-highest quality leather for upholstery, taken from the top of the hide and corrected to some degree with buffing, sanding, or embossing. Q: IS LEATHER STRONGER IF IT DOESN’T HAVE NATURAL MARKINGS? A: The natural markings that you see on your upholstery will have no bearing at all on its strength or durability because manufacturers only use hides if surface markings like bites or scratches have fully healed. They’ll either cut out areas with serious damage or discard the hide completely if there are any questions about its suitability for use. Q: IS LEATHER WITH LOTS OF MARKINGS LOWER-QUALITY? A: Actually, having a number of markings is one of the best indications that upholstery is high quality. Very few hides are acceptable “as is,” so most have to be corrected with dyes and embossing. That’s a cost-effective way to cover ugly markings and produce usable leather from less-desirable hides. However, a hide which has distinctive yet attractive markings and doesn’t have to be corrected produces the very finest leather. Q: DOES THAT MEAN ALL LEATHER FURNITURE HAS NATURAL MARKINGS? SHOULD I AVOID FURNITURE WITHOUT THEM? A: There’s no need to worry about “avoiding” furniture because all genuine leather upholstery does have at least some natural markings. They may be more or less visible depending on the individual hide, color, and finish of the leather. Corrected grain pieces are less likely to show lots of markings and they’ll usually be easily seen on full grain upholstery. Q: YOU MENTIONED THE COLOR AND FINISH OF THE LEATHER. WHAT DIFFERENCES DO THEY MAKE? A: Light-colored upholstery will make it easier to see natural markings, which are often hidden by darker leather. As for finishes, aniline leather will show more of the hide’s markings because the dye that’s used is transparent; it allows both the grain and the markings to be seen. An opaque dye, on the other hand, will cover most of the markings as well as the grain. 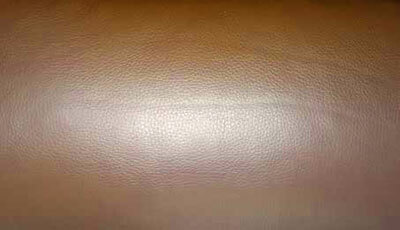 Q: CAN YOU BUY LEATHER FURNITURE WITH LOTS OF NATURAL MARKINGS OR LEATHER FURNITURE WITHOUT THEM? A: If you’re choosing your upholstered furniture from a selection on a store’s sales floor, of course you can choose the pieces whose markings appeal most to you. However, if you’re ordering leather furniture, you can’t ask for “lots of natural markings” – the best approach is to choose pieces made with full grain leather (which won’t have its markings hidden at all) or aniline dyed leather (which will show most markings because it’s treated with transparent dye). On the other hand, since all upholstery will have at least some markings, the only way to order furniture “without them” is to choose top grain leather which has been fully corrected with additional pigment to hide most of the upholstery’s natural markings. Q: WHERE WILL I SEE THE NATURAL MARKINGS ON MY FURNITURE? A: In most cases, the most unique ones will be on the sides or back, or under the cushions. That’s because manufacturers try to maintain a relatively uniform look on the front of leather furniture, where you’ll normally see markings which are more subtle. It is crucial to keep your leather upholstery clean. The best approach (since leather should always be treated gently) is to remove dust, dirt, and grime frequently, rather than do a heavy, intense cleaning every so often. The first step you should take is to wipe down your furniture with a soft cloth to remove dust; don’t forget places like the crevices between cushions and seats, where dust is likely to accumulate. Aniline Leather: Most importantly, never use soap. Simply wipe the furniture with a clean cloth that’s been slightly moistened and then wipe with a dry cloth immediately. 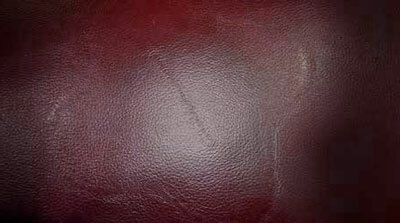 Never allow water to accumulate on the leather; saturation with water will do serious damage to the upholstery. Semi-Aniline Leather: First, prepare a weak solution of water and mild soap (a few drops of soap per quart) and rub a bit onto a “hidden” area of the furniture to make sure the soap won’t harm the leather. Then gently clean the upholstery with a soft cloth and the soap solution to remove accumulated dirt and grime, following that with another wipe down using a damp, clean cloth. Again, don’t allow water to saturate the upholstery. For stubborn dirt, you can add a little more soap to your cleaning solution. When cleaning, be sure to focus on areas where skin regularly contacts the leather because perspiration and skin oils can build up and damage upholstery. Don’t use a commercial conditioning treatment on your furniture because it won’t prevent dirt from accumulating and could render the upholstery’s warranty void. Where Can I Purchase Genuine Leather Products? Check out our collections of genuine leather living rooms and all the leather choices (100+) that we offer. We offer aniline, semi-aniline, pigmented, top-grain, and many more. Leather furniture will give your home a distinctive, distinguished look while providing you with the ultimate in comfort and luxury. Enjoy! This entry was posted on Saturday, September 5th, 2015 at 3:05 pm	and is filed under Tips and Guides. You can follow any responses to this entry through the RSS 2.0 feed. Both comments and pings are currently closed.